This entry was posted on November 16, 2016 at 6:00 am	and is filed under Uncategorized. Tagged: armaments, star trek, starship, weapons. You can follow any responses to this entry through the RSS 2.0 feed. You can leave a response, or trackback from your own site. 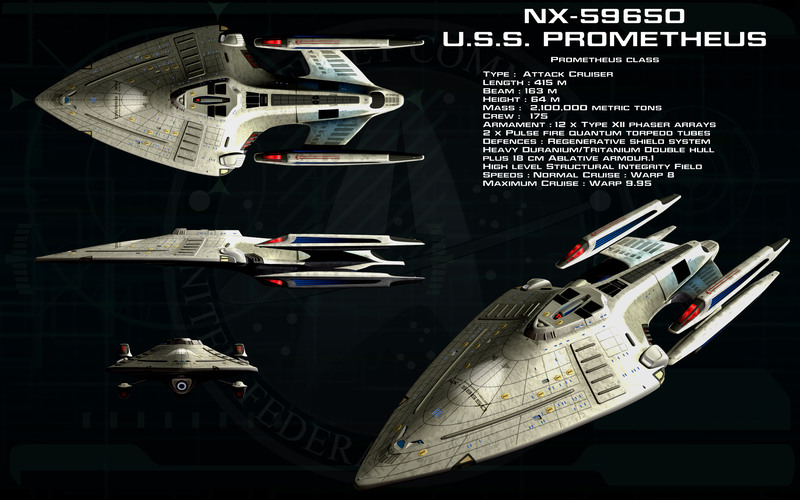 My personal favorite was the Prometheus Class. Too bad there wasn’t a more prominent show around it. About the size of an Akira, but with almost as much firepower as a Sovereign class, yet more potent shields. It’s probably faster and more agile as well. D’deridex for me. It is my conjecture that the reason for the apparent size-inefficiency of the D’deridex stems from a Romulan strategy that sees them used as mobile pseudo-starbases. Given the apparent strategic value of having a starbase in a sector, with their cloaking device the Romulans could hypothetically have much greater strategic flexibility than their neighbors. That is to say any given Romulan sector could hypothetically vary from having virtually no defenses whatsoever or an armada of pseudo-starbases and capital ships under cloak without their enemies knowing. After all, even a cloaked true-starbase only need decloak once, ever, to forever be known about. Possible. D’deridex also appears to be used in a way similar to submarine, decloak, fire a salvo, recloak. This shows in at least one appearance, and explains heavy frontal armament.